In my opinion, this is the best talk of the conference so far. MacNeil gave an in depth look at the estimation of genetic potential, focusing on cow efficiency. My notes are too sparse to do the talk just, so I suggest that you visit the BIF Newsroom to read the proceedings paper, look at the PowerPoint, and listen to the audio (available in a day or so). Define "Efficiency": ability to produce output without wasting inputs. Evaluations shouldn't look at residuals, i.e. measure outputs holding inputs constant or measure inputs holding outputs constant. Inputs and outputs are strongly correlated, thus improving efficiency is rather hard. Cow efficiency is an incomplete picture, though it is a valuable picture. Hopefully indexes take all of the traits into account. The current suite of genetic evaluations is lacking important traits. 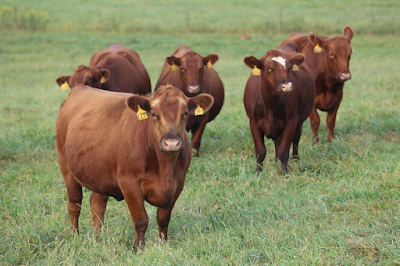 In terms of replacement female costs reproductive traits are important and two traits are currently evaluated, Heifer Pregnancy by AAA and Heifer Calving Rate by AHA. The benefit from the number of offspring is currently measured by stayability or sustained reproductive success. Research suggests there is more variation for maintenance than for performance (Merlyn Nielsen's work in mice). We need work on the genomics of cow maintenance. Every time you make a selection decision, you employ an index! Using an analysis technique called index in retrospect, research can look at your selection decisions and can infer the mental weights you use in your selection decisions. Humans aren't consistent in mental decisions from the beginning of a sale catalog to the end of a sale catalog. Have to use indexes to be consistent. 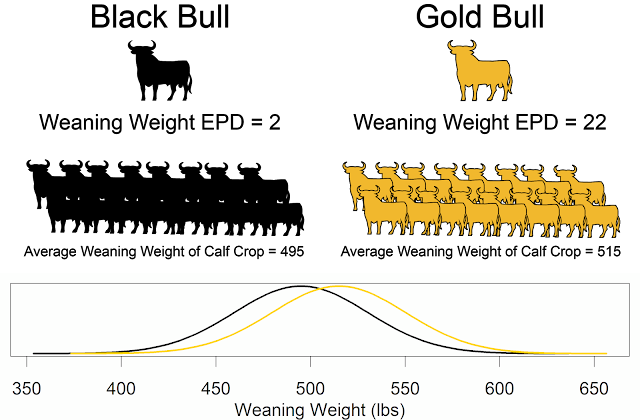 pregnancy (calving) rate and culls - not reporting data on the culls causes problems with evaluating the replacements. Report EPDs on economically relevant traits, calculate EPDs on indicator traits but roll them into economically relevant traits. Create contemporary groups on what actually happened on the farm. Lets be explicit about who leaves and why. *Note: Dr. MacNeil made a note about a project that we collaborate on in which we have proposed to look at local adaptation. Dr. MacNeil stated that the DNA genotype doesn't change, so how would the EPD/breeding value change. This is not accurate. While the DNA genotype doesn't change, the allele substitution effect of the genotype (the "breeding value" of the genotype) does change depending on the population or context. This is the definition of a gene-by-environment interaction. See Falconer and Mackay "Introduction to Quantitative Genetics" for more information on the framework I am proposing. *Update: Dr. MacNeil and I spoke in the hallway at BIF. Dr. MacNeil was considering the true breeding value (unknowable, can only be estimated) and I was considering the estimated breeding value. The true breeding value is independent of the environment. But, when gene-by-environment interactions exists (and we know they do) they would influence the estimation of region-specific breeding values. This does not pertain to national cattle evaluations or national EPDs, only the analysis of local adaptation.